Celebrate the Document that Changed the World! In the summer of 1787, delegates met in Independence Hall in Philadelphia to form one of the most cherished documents in America, our country’s constitution. With 33 year old Thomas Jefferson as the principal author, our Founding Fathers began with the words, “We the People of the United States, in Order to form a more perfect Union, establish Justice, insure domestic Tranquility, provide for the common defence, promote the general Welfare, and secure the Blessings of Liberty to ourselves and our Posterity, do ordain and establish this Constitution for the United States of America”. In order to create “a more perfect union,” these brilliant statesmen crafted the framework that upheld federal and states’ interests, as well as individual human rights. After living under the tyranny of the British monarchy, the intent of three distinct, but equal branches of government - Executive, Legislative and Judicial - was to prevent either branch from wielding too much power. As these patriots signed their names to the document they had scrupulously created, little did they know their actions would change the course of human history. For over two centuries, our nation’s God-given freedoms have served as a beacon of hope for people around the world. Now considered to be the world’s oldest surviving constitution, its model has been used by other nations to create new constitutions. Most assuredly, everything had been put on the line. In fact, many of these brave patriots’ lives and fortunes were ultimately sacrificed for their fellow Americans in their service to their country. Advocates for Faith & Freedom is grateful and privileged to honor the courage of our Founding Fathers through our work defending the U.S. Constitution in the courts and preserving our Religious liberties. Would you like to do something to help ensure that America’s hard-fought constitutional freedoms continue to be part of our country’s brave heritage? Be sure you are an informed citizen. Get to know your elected representatives’ names and pray for them regularly. Register to vote – and then vote your Christian values to ensure that those who represent us and the policies they support share our Biblical world view! 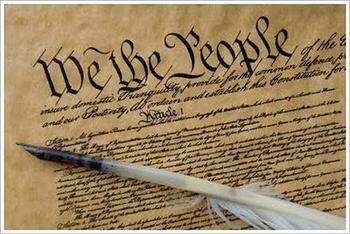 May God continue to bless our great nation, our ministry, and everyone whose constitutional liberties we defend. If America is to have a healthy national discussion about racism we have to acknowledge the emblematic affect the Confederacy's historical figures and symbols have on many black, and white, Americans. First, we'll need a quick review of our history:Following the 1860 election of President Abraham Lincoln the Confederate States of America (Confederacy) was formed when, because of Lincoln’s opposition to the expansion of slavery, 11 slave-holding states seceded from the United States of America. The Civil War started in 1861 when the U.S. Government (Union) rejected the Confederacy and their secession from the United States. After winning the war, in the interest of healing our embattled nation, the Union reasonably thought it would be impractical to arrest and try thousands of Confederate soldiers and generals for treason or sedition. Some say this historical act of prosecutorial clemency erroneously led future generations of Americans, particularly in the South, to regard the Confederacy as patriotic, and its leaders as American heroes. There is no dispute that this weekend’s protest in Charlottesville was led by a hateful fringe group of helmet-clad, white- supremacists whose goal was to preserve the statue of a general who led the battle against the U.S. Army in order to defend slavery. It is also pretty clear that they had an expectation and possible intent of violence. Yet blame for the escalation of violence can be assigned to all sides. So, what should our response be as a nation and as Christians? First, as a nation of laws, while we recognize everyone's Constitutional right to assemble in protest, we must insist that our local government and police departments prepare and pre-empt to ensure the order and safety of its citizens in these predictably volatile situations.Second, as voters and consumers, we can influence our political leaders and the media into embracing a spirit of statesmanship and patriotism by refraining from the damaging and divisive use of political identity labels, which only serve to separate good Americans into racial factions and ideological enemies. Third, our church leaders should show the moral authority to call out and reject these labels which spur hatred and encourage such emotional and violent reactions. And last but not least, as Christians, we can pray for compassion and understanding and acknowledge that for many African-Americans, especially in the South, the leaders of the Confederacy are directly tied to the rationalization of slavery and racism, and the Confederate flag has always represented depravity, prejudice, and violence. This acknowledgment in no way translates into opening the door to erasing America’s Civil War history. However, as a nation, we need to decide if erecting Confederate monuments that commemorate historical figures and events that clearly divide many Americans along racial and moral lines is worth this amount of national anguish? Perhaps, as compassionate Christians and united Americans, instead of memorializing America's history of slavery in honored and prominent places in the public square, we should remember the great suffering and loss the Civil War brought upon our young country by teaching future generations the facts about these historical figures in school and place their stories, statues, and monuments in books, libraries and museums, where they belong. As we face today's difficult moral, social and cultural issues, Advocates for Faith & Freedom asks that you join us in prayer for the healing of our divided nation, our people, and our leaders. We are thankful for your faithful prayers and your tax-deductible donations! All of us here at Advocates for Faith & Freedom wish you a Happy 4th of July! Today, we celebrate the freedoms and liberties that we are blessed with due to God’s grace and the courage and faith of our forefathers. May you enjoy this day with your family and friends, and praise God for this nation and our freedom! Why Do We Celebrate Presidents' Day? This week, we commemorated the amazing leaders of our nation on Presidents' Day. But, do you know why we celebrate this holiday? Originally, the holiday fell directly on the birthday of George Washington, our first president. Thus, the day was meant to celebrate not only this Founding Father, but all presidents that came after him. In 1971, the date was changed to the third Monday in February, leading many to believe that the day specifically commemorated Abraham Lincoln, as well, since he was also born in February. Thus, we often think of these incredible men when we celebrate this day each year. It is an appropriate time to remember just what our Founding Fathers stood for and wanted for the fledgling nation of America. We’ll leave you with a couple of quotes from two of the greatest presidents our nation has known:not only this Founding Father, but all presidents that came after him. In 1971, the date was changed to the third Monday in February, leading many to believe that the day specifically commemorated Abraham Lincoln, as well, since he was also born in February. Our Constitution promises the right to life, liberty, and the pursuit of happiness – and yet our nation is systematically denying millions of unborn babies their right to life. Please join us in continued prayer that abortion would be rejected by our President, Congress, judges, and women who are contemplating abortion. Do you know the TRUE story behind our national anthem, “The Star-Spangled Banner”? In the midst of the War of 1812, three US hostages aboard a British ship wait through the night, hearing the devastating sounds of war raging against a strategic US fort. In the morning, they wake up at dawn, head to the deck, and look out to see whether the US flag is still flying, or if it has been replaced with a British flag…. Want to know the rest of the story? Click here to watch a video from David Barton, President of WallBuilders, explaining this amazing moment in our history. We are excited that David Barton will be our keynote speaker at this year’s Justice Gala! His intimate knowledge of history – particularly from a religious viewpoint – is incredible, and we are blessed to have him share more about our nation’s forgotten heroes and Christian heritage at our event. As the icing on the cake, we have Mike Williams – one of the greatest Christian comics today – as our Master of Ceremonies. Be ready to laugh the night away while supporting Advocates for Faith & Freedom! Justice 2011, taking place on October 1 in Newport Beach, CA, will be one you will always remember…we hope you will join us! Did you know Congress printed the first U.S. Bible? The theme of our annual Justice gala, on October 1, 2011, is“Defending Our Christian Heritage.” In a time when the culture war is raging in our Nation, we can’t think of a more relevant topic to share with you. We are so pleased to have David Barton, president of WallBuilders – an organization dedicated to preserving America’s forgotten history and heroes – as our featured speaker at Justice. His knowledge of America’s Christian foundation shines a bright light on our history, such as the fact that the first Bible printed in English in the U.S. was printed by our government.